From the outside, the house where Honest Oki grew up looks like a collection of large toadstools. But look a bit closer and you might spot a few windows, a door, and even a chimney. In truth, much of the house is below ground, consisting of a network of tunnels. The house had very tight quarters when Oki was growing up for he had to share it with eight sisters, his fretful mother, and a rather overbearing father. This is part of the reason why Oki didn’t hesitate to move into the stump of Ratchet Ringtail at the age of thirteen, when he became apprenticed to the wacky inventor. 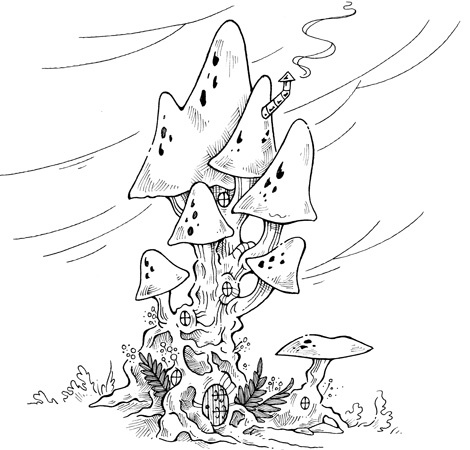 The toadstool house is near the yew tree where Kendra Kandlestar lived with her Uncle Griffinskitch, which is just one of the many reasons that the Een girl and the mouse became fast friends from an early age. Toadstools don’t necessarily make for great houses (like most vegetation), but due to advanced construction techniques that prevent decomposition, the house has lasted many a long year . . . and will surely last a little while yet.